spreading exotic lights, making people expect to have great experience down stairs. It’s been 14 years since open, and still being improving day by day. and now is the time KITSUNE renew on October 30th. 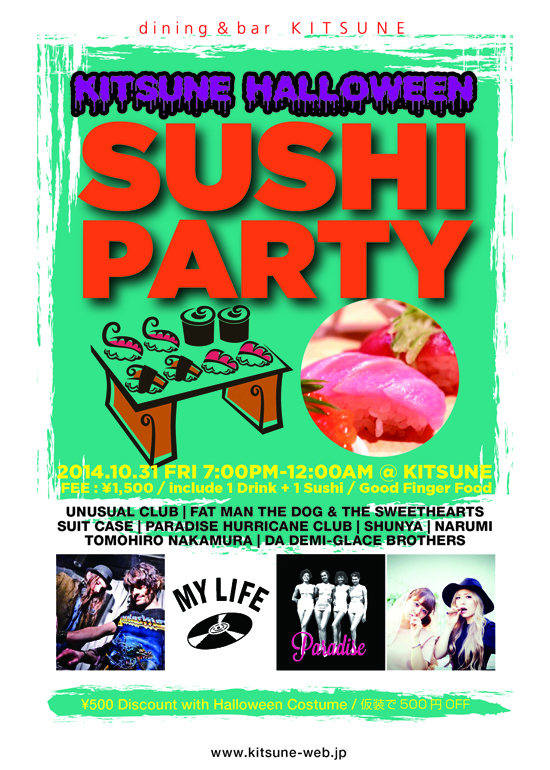 Right after renewed KITSUNE, which is on October 31st, Halloween night, KITSUNE will take place “KITSUNE HALLOWEEN SUSHI PARTY”, which will be the new style of party with our new featured food “SUSHI”. ◎We judge whether your costume is for halloween or not. ◎MUST BE OVER 20 YEAR OLD WITH PHOTO ID TO ENTER. The venue will be closed from October 19th to October 27th.